On the canal de l'Ourcq, (a canal that runs through the eastern part of Paris) there are several locks and bridges. I already showed one of the locks but I never showed any of the bridges. 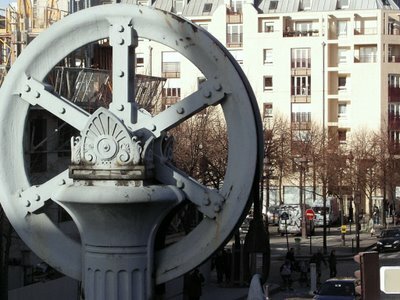 This wheel belongs to the one located rue de Crimée (19th arrondissement) and it used to be a wooden drawbridge (un pont à bascule en bois) but in 1871, it burnt and was replaced by a swing bridge (pont basculant). Here is a view from Google Maps. Boats and locks and bridges, Oh My! I love photos of such stuff. We loved the locks at the canal of Midi. The wheel has a beautiful design. Eric finds the most interesting items. I can't wait until Haxo gives us the scoop. Eric, there is a great canal shot in Last Tango in Paris & Amelie. Do you know if they are the same? I really like the way you have framed this shot. I appreciate the map link too. It just hit me looking at this photo with the leafless trees in the background that it's still cold in Paris. The computer I'm using faces out a window where the palm trees are blowing in the wind. I may have to cancel my trip back. But...this photo also makes me homesick for Paris. Guess I'll just have to change into jeans before landing in Paris. Eric - this is a lovely photo. The wheel is marvellous and frames the photo beautifully. Michael - Singapore is very close to Adelaide! It's still very warm here and you can stay in your shorts. I love your photos. Someday I'll be able to visit them in person, but for now I'll settle for your viewpoint of Paris. Thanks! Boats and locks and bridges, just like Johnny, love the stuff. What a beautiful wheel you found here! Great pic as usual. The grey painting, the column, the "palmette", the boring building behind… it always amazes me one knows one is in Paris. Not London, not Brussels, Berlin, Roma,or Amsterdam. No, you're in Paris and you know it at first sight, without Eiffel Tower, Sacré Cœur, Arc de Triomphe or even a typical Haussmannian façade. Is Paris so typical or is it your talent Eric ? Anyway, I think this view is the essence of PDP ! Great shot of people going about their business behind the wheel. Like it. Ohh Michael, you love it don't you. Palm trees? My world in the UK is white today, crispy, frosty and biting into our faces. Happy now? Send a postcard do. lol. Bridge pulley, trucks, and, yes, rollerblades and a pram on wheels. Zoom in, and there is a family rolling by. GG, I, too, was admiring the wheel design. In U.S, locks and public works projects often are sooo mechanical, "modern" in their stark functionality. Form must provide for function, but this need not preclude visual beauty. I love the wheel's visual elements and the huge chain/cable link. The Bassin de la Vilette (which this bridge crosses) will be filled with barges in late June/early July. The European barging community -- all those folks who have bought old canal barges & fixed them for year-round living & cruising the European canal system -- will be having its annual get-together. First time in Paris, I think. Should be lots of fun to see. FYI, it was snowing on Paris this early morning !!! that's a great shot Eric. We also have a famous swing bridge (a "pont tournant" in French) in Cherbourg-Octeville. Adamantine who manages the blog with me posted an old photo of Cherbourg's swing bridge on 02/05/2007. Thanks for the tip, Jeff. I clicked on the photo and the wheel is so much more massive & impressive. I love bridges that have their own unique character! The historic photo of the Cherbourg swingbridge is great. Thanks Matthieu. I see we have different terms: le pont basculant vs. le pont tournant. And, hey, by the way, a friend of mine in Sacramento, CA, checks out PDP once in a while, but she never comments. She should, as she is an urban geographer. Hi, Ginny! Quelques informations complémentaires sur le canal de l'Ourcq avant d'y retourner muser. Quite often when I have a busy day I don't get to view PDP until the day is almost over in Paris, but I agree with gg that even without the Eiffel tower or the Arc de Triomphe one cannot confuse a shot of Paris with one of London etc...this shot makes something usually overlooked a subject of great interest! Ahhh...Paris, j'adore!! Thanks for opening our eyes Eric!!! GG. " Is Paris so typical or is it your talent Eric ? Anyway, I think this view is the essence of PDP !" Wow, what's wrong with you??! Bigfish. When will this get together take place? Do you know? Matthieu. thanks for the photo, tha's a cool idea. Jeff. LOL on the "Pont Girl (how apropos for you to check in on this photo!) " !! And Well also thanks for the info complement. Viagra is the world renowned medicine for erectile dysfunction and most men have forgotten they ever had a problem with erections after its use. Take it on empty stomach and it will work in 30 minutes. Erections can be achieved on stimulation. Generic Cialis is used to increase blood flow to certain areas of the body, as a muscle relaxant and as a male impotence or erectile dysfunction treatment. 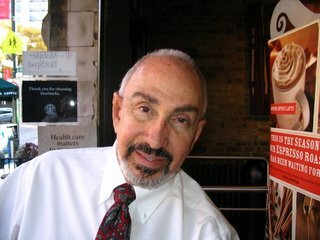 It was many years ago we first selected Top Restaurants in the U.S. See it.